Lumbar disc surgery has evolved from total laminectomy to microdiscectomy technique over a century. While various attempts and efforts have been made to improve lumbar disc surgery, lumbar disc surgery has been a continual prime subject of spine surgeons' research. In order to make lumbar disc surgery minimally invasive, Dr. Jho adopted an endoscope for lumbar discectomy. The use of an endoscope in lumbar disc surgery has made another step advance from lumbar microdiscectomy that is performed with the use of the operating microscope. The surgical visualization by an endoscope is better than with the operating microscope. Because an endoscope can enter into the surgical anatomy unlike to the operating microscope that views the surgical site from a distance, endoscopic discectomy requires a smaller surgical incision and less tissue dissection than microscopic discectomy. Dr. Jho utilizes two different surgical approaches for endoscopic lumbar discectomy depending on the location of the pathology and clinical situation: (1) Posterior, and (2) Posterolateral. Posterior endoscopic discectomy is the first approach, which is performed with a small skin incision made at the midline posterior lumbar region. 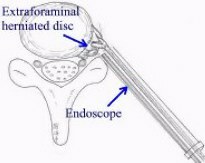 A small trocar is inserted towards the herniated disc. The herniated disc material is removed under the direct endoscopic visualization. The disc located between the spinal bone is preserved as much as possible in order to maintain the spinal integrity. 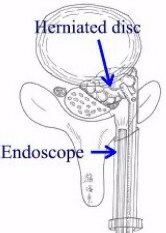 Posterolateral endoscopic discectomy is the second approach, which is used for far lateral disc herniation or a bulging disc. With a tiny skin incision made at a location 10 cm lateral from the posterior midline, the herniated disc is removed under the endoscopic visualization through a small trocar. When disc fragments are ruptured and herniated into the spinal canal, a paramedian posterior approach is recommended. Through a 10- or 15-mm trocar via a 1.5- or 2-cm skin incision, ruptured disc fragments are excised under direct endoscopic visualization. The remaining disc between the vertebral bodies is preserved as much as possible in order to minimize postoperative back pain. Surgery can be performed under local or general anesthesia. Compared to conventional microscopic discectomy, Dr. Jho's endoscopic surgery is carried out with a smaller incision, less tissue dissection, and less bone removal. Recently, microendoscopic discectomy (MED) has been developed by others. 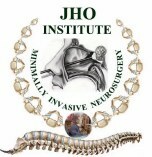 Dr. Jho's endoscopic discectomy is similar to MED in that surgery is performed with the use of an endoscope; however, the details of surgical technique is still quite different. Dr. Jho's surgical tools are smaller and more adjustable than MED. He uses his own specially designed surgical tools for his surgery. When disc fragments are herniated far laterally or the disc is diffusely bulged, a posterolateral approach is recommended. A 10- or 15-mm trocar is placed through a 1.5 or 2 cm skin incision made approximately 10 cm lateral from the posterior midline. The herniated disc is removed under the direct visualization of an endoscope. In cases of a bulging disc, the bulged disc is decompressed. Figure 1. A disposable surgical trocar (1.5 cm in diameter, or 1 cm in diameter for especially thin patients) is placed in a patient's back via a skin incision 2 cm or less (left). The trocar (green) is inserted with a stylet (white) (right). Figure 2. Two intraoperative photographs demonstrate the herniated disc at the tip of a suction cannula and the compressed nerve root that is indicated by an arrow (left). The herniated disc is removed, and the nerve root is decompressed (arrows, right). Figure 3. A small bandage is placed after completion of discectomy. A two-cm ruler is placed left to the small bandage. Figure 4. Preoperative MR scans, axial (A) and sagittal (B) views, demonstrate recurrent disc herniation at L5-S1 in a patient who had once undergone conventional disc surgery. Reoperation was performed with Dr. Jho's endoscopic technique, resulting in complete relief of the recurrent symptoms. Postoperative MR scans, axial (C) and sagittal (D) views, reveal excellent decompression at the nerve root (arrow) and spinal canal. The spinal bone includes 7 cervical vertebrae, 12 thoracic vertebrae, 5 lumbar vertebrae, the fused sacrum, and the fused coccyx. The sacrum is a single unit of solid bone that is made of five segments of vertebrae. The coccyx is approximately four segments of vestigial vertebrae. The lumbar spine consists of five columnar-shaped vertebral bones and five intervertebral discs. The vertebral bone is named with the number from the top in order as L1 through L5. After L5, the spinal bone at the next lower level is named S1, which is the first sacral segment. Adjacent two vertebral bones contain the intervertebral disc in-between. The lumbar spine has five intervertebral discs that are named as L1-2, L2-3, L3-4, L4-5 and L5-S1. The disc contains four anatomical components: (1) nucleus pulposus, (2) annulus fibrosis, (3) cartilage, and (4) ligaments. The nucleus pulposus is the core portion of the disc. It is gelatinous in the early stage of life, but it becomes a more solid structure towards adulthood (but still remains soft). The progressive degenerative process occurs throughout life as a wear-and-tear aging process. The degenerative process consists of the loss of water content and changes in chemical composition. The envelope of the nucleus pulposus is called the annulus fibrosus that is a thick fibrotic tissue similar in toughness to that of an automobile tire. Another component of the disc is the cartilaginous plate that is located adjacent to the vertebral body. Finally, the anterior and posterior longitudinal ligaments wrap the disc circumferentially. The disc functions during motion by deforming its shape and then recoiling back to it's original shape when the motion is completed. Its unique properties allow smooth motions in the spine. In addition to the disc between the vertebrae, two articulated joints (facet joints) are involved in motion. The facet joint is located posteriorly on each side. When the spine is in motion, the disc deforms anteriorly and the facet joints slide up-and-down posteriorly. The terms disc herniation, herniated nucleus pulposus, slipped disc or disk hernia mean that the content of the intervertebral disc is out of place. In this condition, disruption of the annulus fibrosus occurs and the nucleus pulposus slips out through a tear of the annulus. Although it has been used interchangeably with disc herniation, disc protrusion technically designates eccentric protrusion of the disc in less than 50% of the disc circumference. When the annulus fibrosus is diffusely weakened and the disc content bulges out diffusely in more than 50% of the disc circumference, it is called bulged disc. Sequestered ruptured disc means that a portion of the nucleus pulposus is herniated out of the annulus fibrosus through a tear and dislodged, migrated out of normal position. In the pediatric age group, the entire cartilaginous plate can slip away (instead of simple displacement of the nucleus pulposus) due to the presence of the growth plate in childhood (the epiphyseal plate). Symptoms of lumbar disc herniation can be divided into segmental and neural symptoms. Segmental symptoms are caused by local disruption of the anatomy. Low back pain comprises the main symptom but pain extending to the buttocks and legs can be caused as well. Most often, symptoms are confined to one side, although it is possible to have symptoms on both sides. Pains in the buttocks and legs are believed to be referred pains in this condition. Referred pain occurs because the nerve that serves at the disrupted disc area originates from the same segment of the spinal nerve that goes to the buttocks and leg. The body perceives pain at the buttocks and leg despite limited disruption at the spine. This referred pain mimics pain that is caused by the nerve root compression. However, this referred pain usually is confined to the thigh area, and does not travel to the lower leg. The neural symptoms are due to compression of the nerve root adjacent to the disc. When the herniated disc compresses the passing nerve root, it causes electric shooting pains down the leg. It can also cause numbness and weakness in the leg. L5-S1 disc herniation usually compresses the S1 nerve root. Pain will travel to the buttocks, posterior thigh, posterior lower leg and down to the heel. Numbness can occur at the calf area as well. If weakness develops, it will involve the calf muscles and will cause difficulty in walking on the toes (problems with plantar flexion). L4-L5 disc herniation usually compresses the L5 nerve root. Pain usually goes to the buttocks, posterior thigh, posterolateral lower leg and the top of the foot. If weakness develops, it involves bending the ankle, or causing a foot drop (problems with dorsiflexion). Numbness can occur at the side of the lower leg or top of the foot. L3-4 disc herniation can cause, usually by compression of the L4 nerve root, pain at the buttocks, side of the thigh and front portion of the lower leg. It may also cause weakness in bending the foot and stretching the knee and numbness at the front portion of the lower leg. L1-2 and L2-3 disc herniation are relatively rare; but if they occur, they cause pain and numbness at the anterolateral thigh and weakness of the anterior thigh muscles or hip flexion muscles. In extreme cases, the herniated disc can encroach on groups of nerve bundles passing low in the spinal canal to cause "cauda equina syndrome". The cauda equina is the main spinal nerve bundle passing in the lumbar spinal canal. When it happens, bowel and bladder control can be impaired in addition to pain, weakness, numbness and paralysis of the legs. Cauda equina syndrome is an emergency condition that usually requires immediate surgical treatment. Although there are vastly different opinions on treatments, it is generally agreed upon among physicians that conservative treatments should be tried in the acute stage of symptoms unless a significant weakness or cauda equina syndrome presents. Conservative treatments include bed rest with pain medications for a few days (bed rest has been negated as an effective treatment in some studies), physical therapy, chiropractic treatments, nerve blocks, epidural blocks, exercises, etc. When such conservative treatments fail to improve symptoms for a period at least three weeks, usually for more than six weeks, surgical treatments have to be considered. Although there have been various surgical treatment methods such as percutaneous discectomy or invasive fusion treatments with or without metal implants, classic conventional discectomy including microscopic discectomy is a prevailing gold standard treatment for classic lumbar disc herniation. It involves an approximately two-inch skin incision, bone opening at the lamina towards the herniated disc, and removal of the herniated disc. Microscopic discectomy has gained popularity in recent years because it improves illumination, and visualizes well through a relatively small incision. Further advances were made with the adoption of an endoscope in conventional lumbar discectomy. This endoscopic lumbar discectomy is different from other percutaneous endoscopic discectomies in that the conventional classic disc operation is performed under endoscopic visualization through a much smaller skin incision than with conventional microscopic discectomy. It involves minimal tissue dissection and preserves the remaining disc while achieving removal of the ruptured disc fragments as well as the conventional discectomy technique does. The Jho procedure for Lumbar Disc Herniation is accomplished through a skin incision approximately 1.5 to 2 cm in length. Patients are often able to return to work in 4 to 6 weeks. A patient who has a herniated lumbar disc, suffers from low back pain and pain in one or both legs, and has not received benefit from conservative measures such as physical therapy, may be a candidate for endoscopic lumbar discectomy. While the patient is under general anesthesia, the surgeon places a trocar (which is a small tube for surgical access through which surgical instruments are passed) and then utilizes an endoscope and specially designed surgical tools to remove the herniated disc fragments. Usually, the remaining disc between the vertebrae is not removed unless recurrent disc herniation is anticipated due to a large defect at the annulus (the disc envelope). The surgical incision is small and often only measures 2 cm or less in length. Patients are usually physically able to go home the day of their surgery. However, postoperative patients are usually kept in the hospital overnight for observation. Recovery is often quick and patients usually return to work in 4 to 6 weeks. Postoperative physical therapy is rarely required. discectomy - refers to removal of a portion of the intervertebral disc.